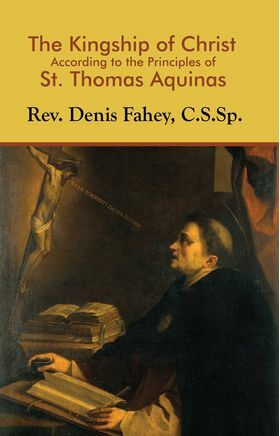 This book is the first published by Fr. Denis Fahey, the great apostle of the Kingship of Christ in the 20th century. In it he lays down the essential philosophical and theological principles that undergird and enliven the entire published corpus of his life’s work in defense of the Social Rights of God, in direct opposition to the nefarious Declaration of the Rights of Man that was the published declaration of war against Catholic civilization issued by the “enlightened” Freemasons who were responsible for the French Revolution. The war that Fr. Fahey so clearly delineated and chronicled is still engaged, even though few Catholics understand the nature and the extent of this war against human society and especially against Our Lord in His Mystical Body, the Catholic Church. The two ancient battle cries “We will not have this Man rule over us!” and “Non Serviam!” have been vividly revived in the 20th century by a host of enemies of Christ’s Kingship over human society. Until all human society—especially national governments—publicly recognize that Kingship, civilization will continue on its downward spiral. We hope that the re-publication of Fr. Fahey’s works will assist the Faithful in their attempts to restore all things in Christ for the future of our children and our children’s children and for the Greater Glory of God! Preface . . . . . .
Author’s Note . . . . . .
Editor’s Note . . . . . .
Man’s Fallen State . . . . The Kingship of Christ . . . The Real History of the World . .
What the Church Has Said About the State’s Putting All Religions on the Same Level . The Spirit of the Age . . .
Pope Leo XIII on Tolerance . .
Constitutions of Some Catholic States . The World Struggle Around the Divinity of Our Lord . . . . . Some Extracts From Papal Documents on the Duties of Catholics . . . .
Our Supernatural Life and Nationality . The Association of Reparation to the Most Holy Trinity . . . .